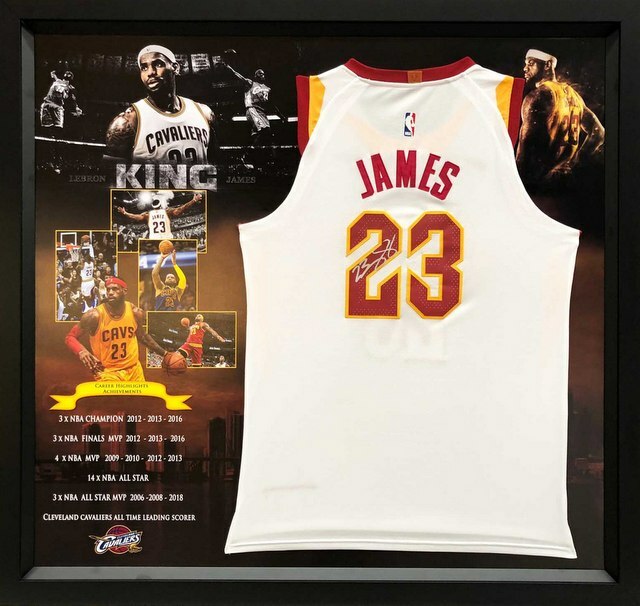 LeBron James Personally Signed Cleveland Cavaliers Authentic Jersey, Home White - SPECIAL! James has won three NBA championships, four NBA Most Valuable Player Awards, three NBA Finals MVP Awards, two Olympic gold medals, an NBA scoring title, and the NBA Rookie of the Year Award. He has also been selected to 13 NBA All-Star teams, 13 All-NBA teams, and six All-Defensive teams, and is the Cavaliers' all-time leading scorer. LeBron's signature is guaranteed 100% authentic by virtue of Sports Online's 100% Authenticity Guarantee. Interest-Free Instalment Option: 3 monthly payments of $240.00 (unframed) or $346.67 (framed). The item is sent after the final payment is made. Lebron James Personally Signed Basketball, Silver Signature - SPECIAL! LeBron James Personally Signed LA Lakers White "Association" Jersey - SPECIAL!